OLEN CESARI "Ave Maria in Rio"
A small room that we have forgotten that even exist. Pure like the love of a mother to her child that follows her, exploring the world step by step and day by day. Love is the reason why we do things and in this clip the little girl is finding an other kind of love beside the one for her mother. This journey is the pilgrimage towards the Cristo Redentor with the music that they are listening coming from the arm of Christ. The vision of faith and hope in music. Embracing us all. 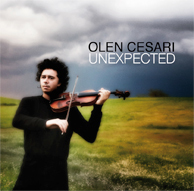 OLEN CESARI "Anema e core"
"Anema e Core" is one of the absolute gems of the album "Unexpected". Classical song of the Neapolitan repertoire by S. D'Esposito, Olen Cesari has turned it into a masterpiece of rare beauty, using the lyrical and animistic piano of Sergio Cammariere and the voice of Lucio Dalla who always surprises for its intensity and inspiration. This beauty is also found in the video where the director Jan Michelini stabs things with a completely new look and brings us back to the "splendor of truth." Images that are a sort of personal expression, pages of a diary, capturing that moment where the future and the present become reality in an endless moment, leaving us suspended in the enchantment of a look that deeply touched.